Voice from Hellas. My last article, Greece – The Refugee Crisis and the Horror of Europe ended with the story of a 3-year old Iraqi boy (image below), a refugee, coming from Syria via Turkey, found in a Park in Kos, with his father. The boy was diagnosed with cancer. The doctors’ prognosis for the boy was not very good. But the Greek health system would do whatever it takes to safe the child. A few days ago, the boy was airlifted from Kos to Athens to the Children’s Hospital ‘Geniko Nosokomio Pedon Panagioti kai Aglaias Kiriakou’, one of the country’s two largest public children’s hospitals. The health facility emits positive vibes, corridors and rooms are bright and spotless. Nurses play and laugh with children. The warmth and care kids so much need is imminently there. The Iraqi boy’s real name is Mohammad Ali. He is in a bright, clean room with other children, hooked up to monitoring machines and medication. His father is also there. He does not want to give his name or being photographed. He speaks poor English but with some interpretation we understand each other. With a cut-knife gesture across his throat he signals what the Daesh-ISIS jihadists, the product of western powers, would do to him if they could identify him. Daesh destroyed the Syrian village to which he fled several months ago from Iraq in the hope to find medical treatment for his son. 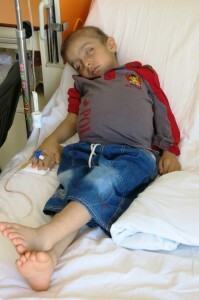 Syrian doctors diagnosed the boy with liver cancer. They performed surgery on the child and were able to remove the cancer but did not have the medication for continuing chemo-therapy and other follow-up treatment. Western boycotts – the western murder sanctions – stopped vital medication from reaching Syria. When Daesh ravaged the town, the father’s wife, Mohammad’s twin brother and two sisters, with other family members fled to another Syrian village, while he and his son, escaped to Turkey from where they would reach Greece, from where he was planning to go to Germany or to the Netherlands, where doctors in Syria told him he may get better treatment for his son. The father has lost all contact with his wife and children in Syria, but hopes that they are still alive. The trip across the narrow straight between Bodrum and Kos takes usually place at night by inflatable rubber boats which load between 15 and 25 people. These crossings are precarious as boats are often overweight and vulnerable to sinking. They are also often attacked by mafia-type gangsters and robbed. They also risk to be picked up by the Greek Coast Guard and may be returned to Turkey; in that case new crossings would need to be planned – and paid for – afresh. Refugees do not just give up. This happened to several of the refugees we met in Bodrum. A typical journey from Bodrum to Kos may cost as much as € 2,000 per person, money often collected by family members back home. When Mohammad Ali and his dad were found in a public Park of Kos, they were soaking wet. We were told both in Bogrum as well as in Kos, that when a rickety rubber boat reaches close enough to the Greek shores, the refugees often cut the rubber dingy, disinflating it and start swimming, calling for help. When discovered by the Coast Guard, by law they have to be taken aboard and brought to safe shore. The boy’s father did not confirm the entire story, but he did say that at the end they had to swim. A city of Kos volunteer, Georgia, took them to a Kos public hospital, where the kid’s cancer was confirmed. – How does a little boy, a baby for all practical purposes, contract cancer? – Spent uranium is known to cause cancer, fetus deformations in pregnant women with consequences for generations to come – and affect immune systems. The US army and some of its allies are infamous for massively using bombs loaded with spent uranium heads in Iraq and other places, where the US / NATO war machine and their jihadist proxies annihilates entire populations. Let us be reminded that Daesh / ISIS are funded and supported by the west, mainly Washington, the Saudis, Qatar and Turkey, but their financial branch of actual funding is constantly shifting so as not to be easily identifiable. The US / NATO reckless killing machine, in which the European Union is complicit through their participation in NATO and through their spineless direct support of the empire. The increasing stream of refugees of which by July already more than 100,000 have been received by Greece since the beginning of 2015 (more than double those fleeing to Italy) is a direct result of these hegemonic wars and conflicts inflicted by Washington with the help of the very EU; a EU that openly and violently reneges any responsibility to take in and accommodate these migrants from death threats and economic disaster. 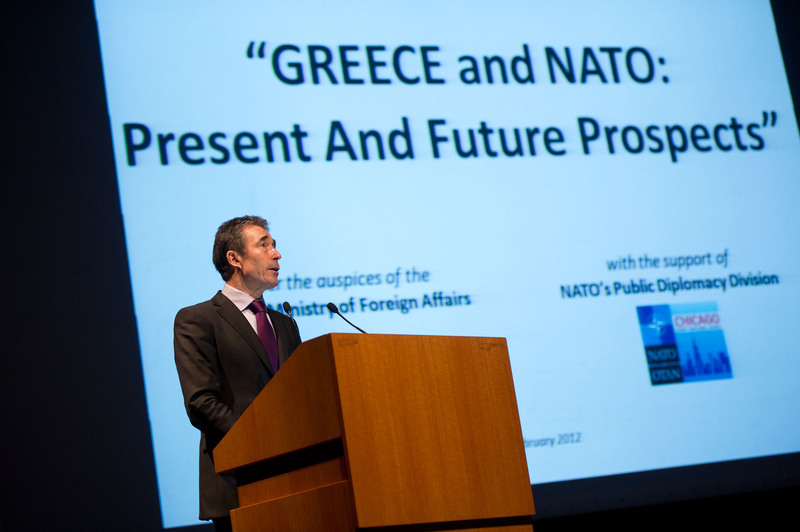 It is absurd that Greece, also a NATO member, but with a ‘nominally’ socialist government, has been financially strangled and coerced to the point of abandoning any socialist principles – worse, the EU and Washington’s financial masters of the universe have blackmailed Greece’s leaders into abandoning its constitutional democracy by acting with 180 degrees reverse measures overturning the people’s vote of 61% against the for generations to come suffocating austerity measures. These punishing conditions come with an additional debt of 86 billion euros, of which not one single euro would go to Greece’s economy, but only to the banks for servicing and restructuring Greece’s debt. It would increase Greece’s debt – to about 450 billion euros, or 210% of its steadily declining economic output. As these lines may go to print, the Greek government is in the process of negotiating the details of this new ‘deal’, behind closed doors so to speak, with the troika and especially the new emperors of Europe, Germany. This is going on in the midst of the summer heat, when Greece is on vacation. No protests, not even spontaneous ones, are taking place or are panned. As a reminder – please be aware that Germany is the biggest debt transgressor of the 20th century. The debt Germany has been wiping out and eventually was ‘forgiven’ by the allies, including reparation payments to Greece of some 170 billion dollars in the 1950’s (in today’s terms at least double that amount in euros) – is almost infinitely higher than the current Greek debt to the non-elected unit of the troika. Greece has lost 8% of her population in WWII, defending Europe from German fascism. Never mind that all is illegal and a decent Greek government could over-night declare the parliamentary vote against the people’s voice unconstitutional and null, because the power of parliament is constitutionally subservient to that of the people. Also, almost the entire debt accumulated by Greece is internationally illegal, as it was acquired under duress, coercion, corruption and even blackmail. None of such contracts would stand up in an international court of law – if there is still one left that has the decency to defend international justice. Is Greece taking such measures to safe its people from ever increasing misery? – There is still hope. The deadline set for the end of these quasi behind closed doors negotiations is about 20 August 2015. That is also the date for which the first protests are planned. Back to the little Iraqi boy – while Mohammad Ali’s attending doctor did not want to speak to me (as I am not officially accredited as a journalist), the oncologist at the Athens children’s hospital did answer a few questions. He did not want to comment on the question of spent uranium, but he eventually said that although the boy was still in critical conditions, the chances that he could be cured were relatively good. He added that kids were very resilient, that for them even liver cancer was not necessarily terminal, as it would be in most adult cases. 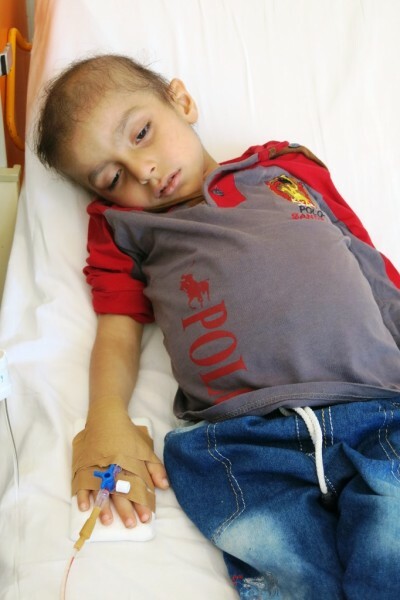 Within the next days, the oncologist – who did not want to give his name – said Mohammad will be transferred to the oncology department where he would receive chemo-therapy and the necessary cancer care. The father had already communicated with a medical doctor in the Netherlands who told him, ‘if you can get to my country, I’ll take care of your boy, but I cannot help you to get here’– meaning the papers were the hindering block. The boy’s dad looked at me with hoping eyes – however, I could only confirm what his doctor friend in Holland said, obtaining refugee immigration papers in the EU was extremely difficult. Be happy that you are in a country – Greece – which despite all her own financial and political difficulties had the generosity and solidarity to help your child for free. Mohammad Ali’s destiny is not known, but he is on a positive track – and more importantly he is in good and caring hands. May he be testimony and symbol throughout Europe and the rest of the world for Greece’s compassion for refugees and their fate, for Greece’s generosity and thriving sense of solidarity – a sense of kindness that has been gravely devastated in the rest of the western world! May a story like Mohammad Ali’s, of which there are surely countless others not known to the common citizen at large – bring back compassion, solidarity and consideration for our brothers and sisters at large into the mindset of peoples’ values of our western society – and the courage to take drastic steps to follow human principles despite threats – exit NATO, exit the Eurozone, become a free, sovereign country again with new alliances. Others have done it before – Greece can do it too. 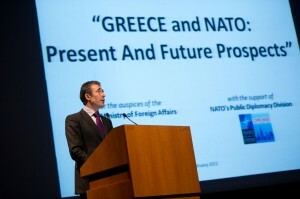 Peter Koenig is an economist and geopolitical analyst. He is also a former World Bank staff and worked extensively around the world in the fields of environment and water resources. He writes regularly for Global Research, ICH, RT, Sputnik News, TeleSur, The Vineyard of The Saker Blog, and other internet sites. He is the author of Implosion – An Economic Thriller about War, Environmental Destruction and Corporate Greed – fiction based on facts and on 30 years of World Bank experience around the globe. He is also a co-author of The World Order and Revolution! – Essays from the Resistance.